Nestled on the coast of the sapphire blue Adriatic Sea, in the country of Croatia, sits the ancient walled town called Dubrovnik. Once called the “jewel of the Adriatic” by the great poet, Lord Byron, Dubrovnik sits much like she did centuries ago: mysterious, beautiful and protected by thousands of stones set in a winding wall. One must see the very walls whose erection began around the 13th century and was not completed until the 16th century. The awe-inspiring walls were built to protect the village from the invasion of the Turks. See what the human spirit is capable of creating in order to protect home and family. A walking path winds all along the walls. Taking this stroll is a good way to get acquainted with the epic history and strength of spirit of Dubrovnik. A truly Gothic 15th century palace is a sight to behold. Especially one of Eastern Europe’s most historically monumental palaces. The magnificent palace was originally built for the ruler of Dubrovnik, the rector. 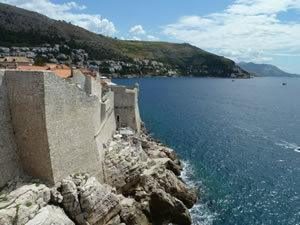 Today many summer festivals are held here and it is a daily museum of all of Dubrovnik’s history. The palace is located at Pred Dvorum 3 with hours from 9am till 6pm. One cannot come this close to the Adriatic Sea without splashing in the dark blue waves. One of the most gorgeous and clean oceans, the Adriatic Sea is virtually unharmed by pollution and mankind’s modern inventions. Full of the finest lobster, sardines and tuna in the world, Lapad Bay on the Adriatic Sea is a great place to stop for a world-class seafood dinner. 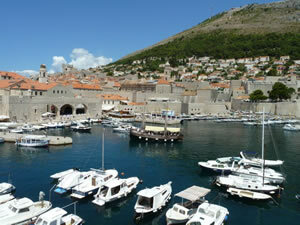 Daily charter boats head out to the beautiful coastal areas around Dubrovnik such as Montenegro. This newly independent nation, Montenegro, is another one of history’s mythical gems. One can rent bikes to see the tiny nation up close and personally. This is literally Europe’s newest country, proclaiming independence June 3rd, 2006.